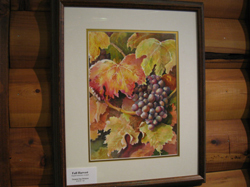 The Shaver Lake Art Gallery is located in the quaint village of Shaver Lake. It was founded by a group of ten local artists in February 2008. In 2009 the gallery relocated to its present venue and now features the works of 25 artists. As a cooperative, the gallery is staffed by local artists who can often be found working on art projects when you visit. The Shaver Lake Art Gallery presents a distinguished selection of art inspired by the beautiful Central and southern Sierra Nevada mountains, lakes and streams.